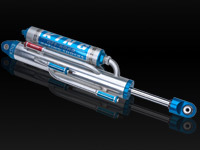 King's Pure Race Series shocks represent the highest level of race shock development; they are designed with one purpose in mind, all out racing. Our constant process of research and development has allowed us to dominate in the toughest races on the planet like the legendary Baja 1000 and the Dakar Rally. The Pure Race series have unique materials and design features to withstand blistering temperatures up to 450 degrees and the immense forces encountered by the fastest competition only vehicles. Every aspect of these shocks has been optimized to deliver brute strength, unparalleled performance and precision adjustability. 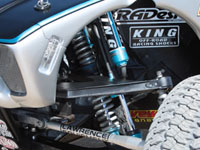 King Pure Race series shocks deliver the control you need whether you are floating through the whoops in a high strung screamer or punishing the dirt in your big bore heavyweight. We have the design attributes, quality of materials and depth of tuning knowledge necessary to make you a contender every time out. 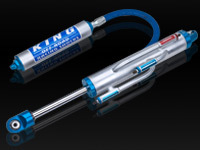 The unique flow characteristics and damping capabilities of King, Pure Race series shocks, will help your race vehicle perform to its highest potential. If your goal is to dominate the competition you need to experience the level of control a set of King Pure Race Series shocks will provide. Nothing rides like a King. King, Pure Race series bypass and coil over shocks are built to exacting standards with one thing in mind; performance above all else. 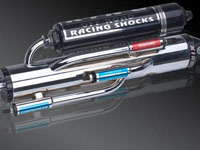 Bypass shock tubes are made from 4130 Chromoly material. The bypass ports are cnc drilled then hand de-burred and polished. The bypass tubes are beautifully tig welded in their designated locations before the completed assemblies are pressure tested to 300 psi. The welded and plated bodies are then precision bored to +/- .001 of an inch before honing. The ports consist of an array of smaller holes to help maintain piston seal. The piston slides over the fluid passages without scuffing the wear band or seals. The port openings are meticulously flow matched to the bypass tubes to provide unrestricted fluid flow to the valves. Tube locations are determined using your vehicle specifics and our knowledge base accumulated through years of testing. They are designed as a left and right and come with your choice of reservoir mounting options to fit your chassis like a glove. King bypass valves are built to critical tolerances using high-temp 17-4 stainless steel alloy. Our adjusters offer a level of functional adjustability that is unmatched. The first turn of the high strength heat treated adjusting screw offers the same precise metering as the last. Each bypass stage is separately tunable, position sensitive and operates independently from the others. King’s cold drawn 2024 billet aluminum piston design incorporates our deep understanding of fluid dynamics and precision machining abilities. The gapless, Teflon impregnated bronze wear band is pre-loaded in the piston groove with a Viton o-ring so it fits tightly into the bore and creates a double seal. This optimizes valving function and on the bypass shock seals so well that it allows the final compression stage to be used as a hydraulic bump stop. King bypass and coil over shocks contain stainless alloy heat treated valve shims that remain stable at high temperatures to maintain consistent damping and avoid fatigue cracks like carbon steel shims. 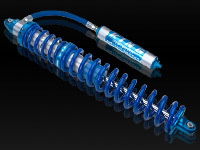 King Pure Race coil over shock bodies are machined with our own truncated thread design to produce ultimate strength and trouble free spring adjustments. Our three piece adjusting nut assembly has a unique pinch bolt design that offers superior clamping force to retain your coil preload adjustments without crushing the threads like set screw style collars do. It also includes an upper spring centering ring and nylon antifriction disc to make quick work of adjusting even the heaviest springs under substantial preload. Our machined billet nylon coil sliders maintain proper spring alignment and silent operation while withstanding temperatures up to 450 degrees. Progressive dual rate spring applications use a set of lockable secondary nuts threaded onto the body to allow precise adjustment of secondary spring engagement. King Pure Race series reservoirs are the largest in the industry and feature threaded end caps to endure higher pressures and ease maintenance. Their lightweight aluminum construction aids in heat dissipation and will not rust due to condensation or gas charging contamination. We use only the best Aeroquip hoses and Parker fittings with our remote reservoirs. The Aeroquip hoses are extremely durable with the highest temperature and pressure ratings and are able to bend tighter without kinking like braided steel lines. Our rod end attachment method has been in use for 13 years without a single failure. We hydraulically press the shaft through a threaded bung then tig weld the bung to the end of the shaft. The rod end is then threaded onto the bung. This design removes all threads from the external portion of the shaft end giving it incredible strength. Our large 1” and 1-1/4” diameter shock shafts are induction hardened to 60-65 on the Rockwell scale, hard chrome plated and then micro-polished to a mirror finish. The incredible hardness protects against rock rash and the mirror finish creates a highly effective seal that does not weep. 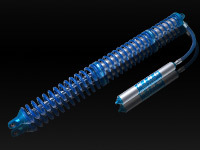 Every part that goes into our shocks has been torture tested under brutal race conditions. We use only the finest materials available under strict quality controls and tight tolerances to insure the race winning performance and ride quality that King is known for. All this adds up to a level of control and precise adjustability that is unrivaled. Nothing rides like King.